A view of Curtain Road from Great Eastern Street in the 1900s and now. 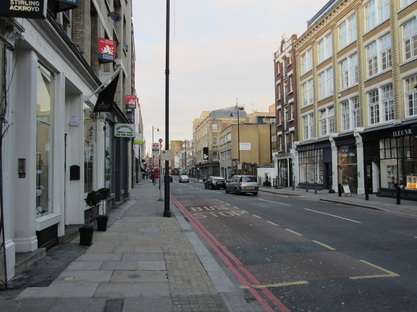 Formerly part of Holywell Street, Curtain Road has a history as long as itself. In fact, the name Shoreditch arises from this very part of the area; ‘Soersditch’ as it was known, interpreted as ‘Sewer Ditch’, was thought to be in reference to the boggy watercourse of the river Walbrook, which rose in the general direction of Curtain Road. Charming. Things probably started to look up for the area after the small hill that cut across the street, Holywell Mount, was levelled because of the muggings and murders that happened there. With that little bit of gruesome geography literally squashed, The Theatre (not to be confused with Curtain Theatre which came later) was constructed in 1576 by actor-manager James Burbage on property that had originally been the grounds of the dissolved Halliwell (or Holywell) Priory - interestingly, Shoreditch was actually part of Middlesex back then. It’s ascent into becoming part of the Hackney we know and love most likely starts with the rise of the London College of Fashion (LCF) university campus, which sits smack bang in the centre of Curtain Road today. With it having evolved from the Shoreditch Technical Institute Girls School in 1906, this was surely destined to be a trendy area. 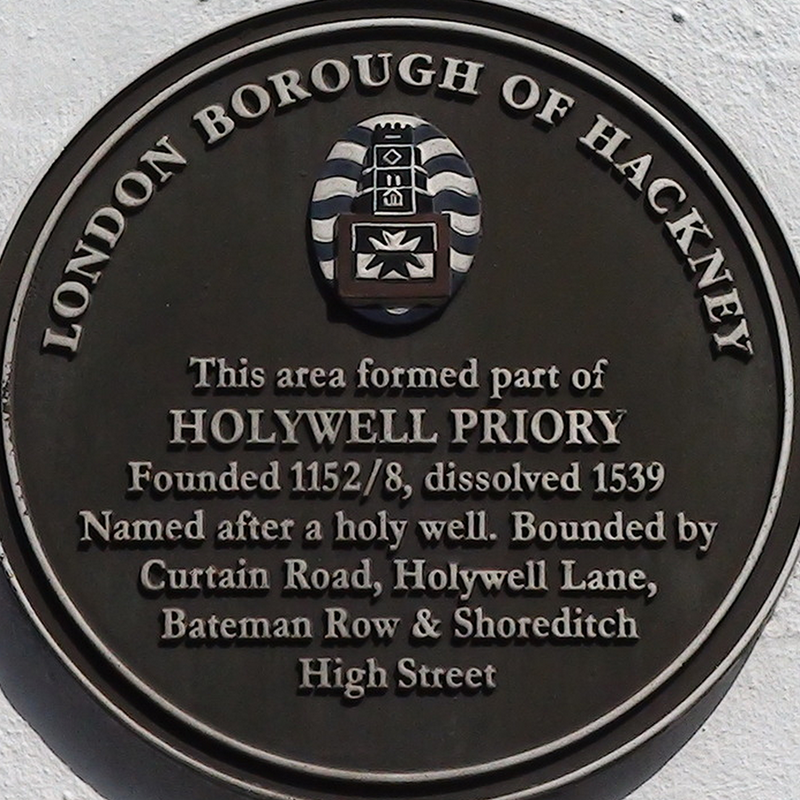 Holywell Priory was an important religious house in Shoreditch established in the 12th century. Originally known as Halliwell, the priory was surrendered by 1539 during Henry VIII's 'dissolution of the monasteries', which resulted in ‘moveables’, such as jewels and silver - essentially items stolen by the king. Even the lead from the ceiling wasn’t safe, being ripped from the vault and utilised in the repair of the great roof of Westminster Hall. Holywell Priory in Wyngaerder's 'Panorama of London' circ. 1540. Traces of the old priory (still in the same location that is) were found in 1863 during the construction of the Middle Level Sewer that crossed London from Beckton to Hampstead, with two leaden coffins discovered 15 feet to the south of New Inn Yard lying side by side, enclosed by walls of chalk. 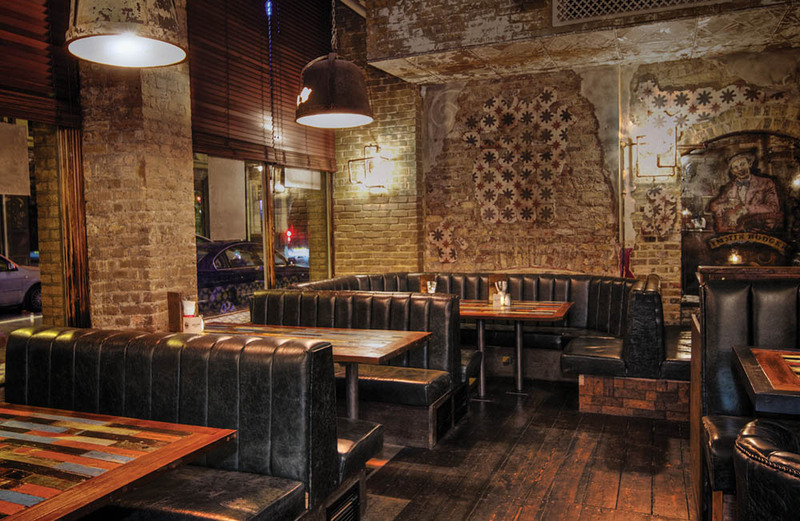 While there are no visible remains of the priory in modern Shoreditch, Slate Coffee is amongst the properties that now exist on the site. Even after its disunion in the 16th century the priory’s land remained a central area of importance in Shoreditch, with the nearby establishment of The Theatre and Curtain playhouses forming a cultural hub for actors and playwrights. James Burbage - famous Shakespearian actor and founder of the two theatres - lived in the houses that connected to the priory’s old brewhouse, and a marble tablet can now be found in memory of the 'players, musicians and other men of the theatre'. 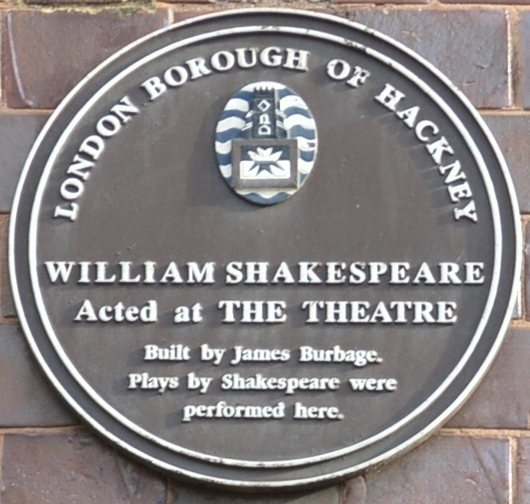 In 1576, James Burbage - a man of various talents including acting and building - combined his skills to begin construction on The Theatre - named so because it was the first building ever erected for scenic exhibitions in London. He completed and opened it in the same year, providing an abode for dramatists and performers who had been prohibited from performing within the City walls. This new playhouse was perfectly placed just a meandering footpath away from Finsbury Fields, which now follows the trajectory of what is now Holywell Row. Its players were eventually pushed out and James, said to be the man “who bridged the gap between late-medieval drama in England and the flowering of the great Elizabethan Theatre,” simply built a second venue 100 metres further back on the same street, with The Curtain making its debut a year later in 1577 - named aptly after the walled pasture of its location as opposed to theatre curtains. The first performance of Romeo and Juliet was given in The Curtain. On 28 December 1598, with its' lease about to expire and the land and theatre on it set to revert to the landowner, the wooden theatre was dismantled, transported through The City and across the frozen Thames where it was rebuilt as William Shakespeare’s The Globe in Southwark. 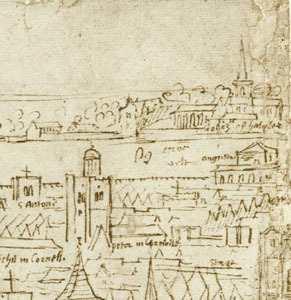 A zoomed in illustration of the above map - this is part of a view of the City of London looking from the North towards the South. It shows The Theatre on the far left and to the right of it is the flag of The Curtain playhouse. Contemporaries of Ben Jonson and Bill Shakespeare, this was the era in which James’ sons - Cuthbert and Richard - took to the stage, with the latter said to be a fellow and friend of the Bard. 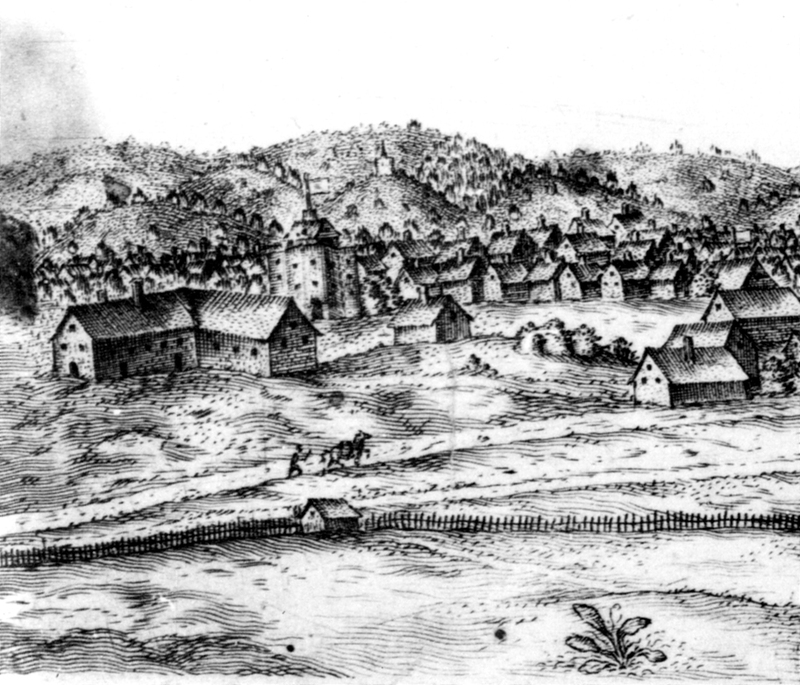 True locals, Richard Burbage is believed to have lived and died on Curtain Road - in fact, members of the Curtain Theatre survived an earthquake on the afternoon of April 6th 1580 and closing down due to the bubonic plague from 1592-1594. Of the tremors, an eye-witness said the audience “leapt down from the top of the turrets, pinnacles, and towers where they stood, to the ground, whereof some had their legs broke, some their arms, some their backs, some hurt one where, some another, and many score crushed and bruised.” Now that’s drama for you. 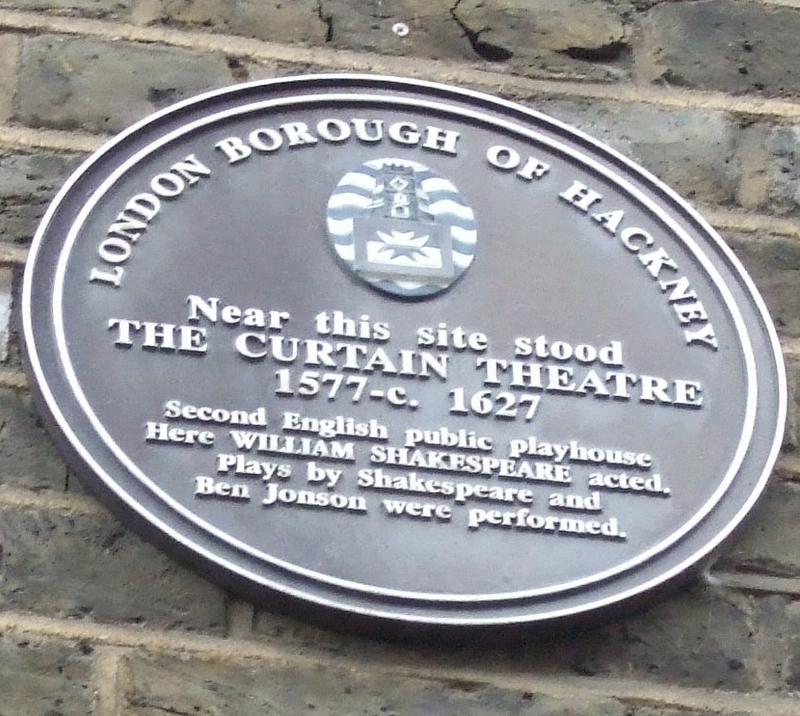 Hackney Council placed a commemorative plaque for The Theatre on 86-90 Curtain Road and mistakenly for The Curtain on 18 Hewett Street, back in 1993. Later it is believed Christopher Marlowe’s Dr Faustus was staged here and John Marston's 1598 masterpiece The Scourge of Villainy even mentions the Curtain: “Luscus, what’s played today? Faith, now I know I set thy lips abroach, from whence doth flow Naught but pure Juliet and Romeo. Say, who act best? Drusus, or Roscio? Now I have him, that ne’er of aught did speak But when of plays or players he did treat. He’th made a commonplace book out of plays, And speaks in print, at least whate’er he says Is warranted by Curtain plaudities.” Unlike The Theatre, plays continued here well into the seventeenth century and it seems it was still standing in 1698. The last recorded troupe was the Prince Charles’ Company, holding productions there between 1620 and 1625, however there are occasional accounts of fencing matches and boxing tournaments thereafter, and narratives giving testimonial to people living at ‘Curtain playhouse’, indicated it had been converted into tenements for rent. Now parts of what would have been a 72 foot diameter polygonal establishment have been discovered underground in its actual spot near to where present day pub The Horse and Groom stands - at number 28 Curtain Road (see above). This would have been the entrance to the west, and the stage would have been to the east. The site is undergoing excavation with a small part of the building uncovered, including the walls forming the galleries and the surface of the central yard, though a lot more - up to three quarters, is expected to be revealed as the project continues. Planning permission has been given to develop the site into a landmark attraction, displaying the general history, preserving the raw skeleton of the structure and illustrating the working conditions of William Shakespeare. The Curtain Road Gasworks was a production centre set up in 1813 by the world’s first gas company Gas Light and Coke Company to supply the local community with municipal lighting and heating. 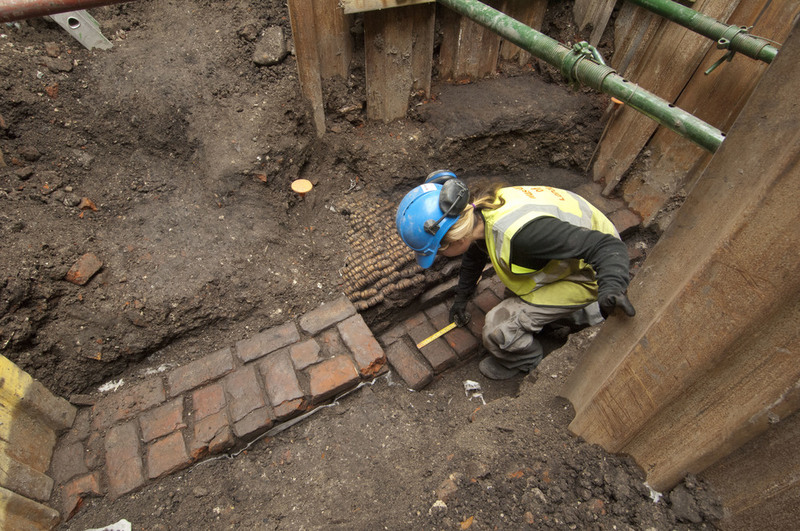 Pre-large scale industrialisation, brick and timber remains have been found and are currently under excavation, with the finds indicating each part of the manufacturing process and the whereabouts of early apparatus. 19th century architectural residuum includes ‘retorts’ or cast iron ovens that would heat mounds of coal to set off gasification, as well as the framework of the follow on phases. If we look backwards, the dig has actually led to further investigation into the 17th century history of the very same site, as well as a Roman cemetery nearby. Going forwards in the timeline, the gasworks was closed in 1871 to make way for a railway viaduct that would lead into Broad Street railway - eventually the western part of the site became a coal yard for the railway and the eastern part turned into tracks that still lead to Liverpool Street station. Once a patchwork of farmland, today it is the notable owners of these large estates that lend their names to the local streets of Shoreditch. 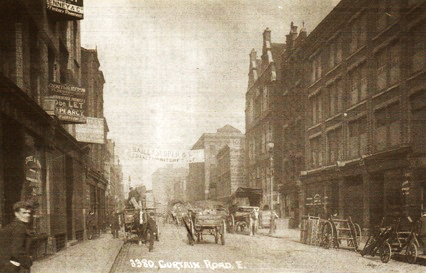 Curtain Road was part of the grounds, and its grand houses exchanged hands multiple times over the years. The area eventually became home to the wholesale furniture industry, as the early 19th century saw it develop into an epicentre of manufacture, sale and supply for trade both here and abroad. Curtain Road Arts was a 90s artist-run project based in an old furniture warehouse on Curtain Road. 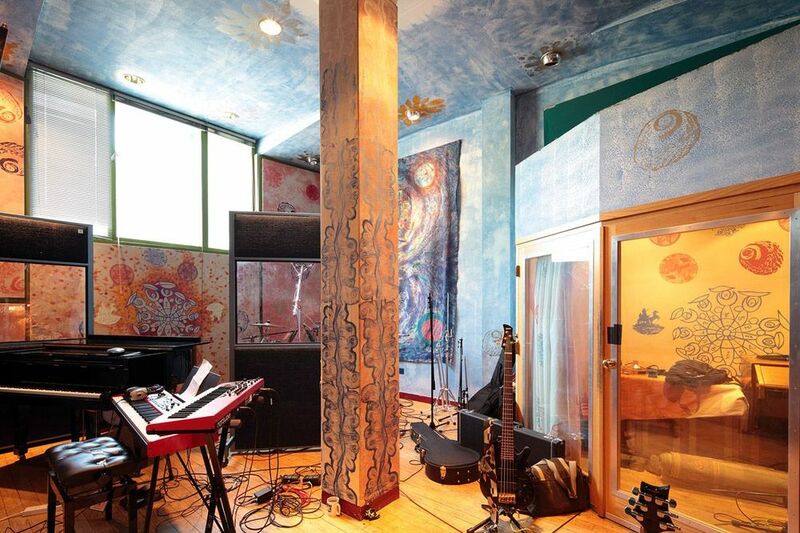 The space acted as a ground breaking art studio for upcoming artists, some of who have since made waves in the international art scene. 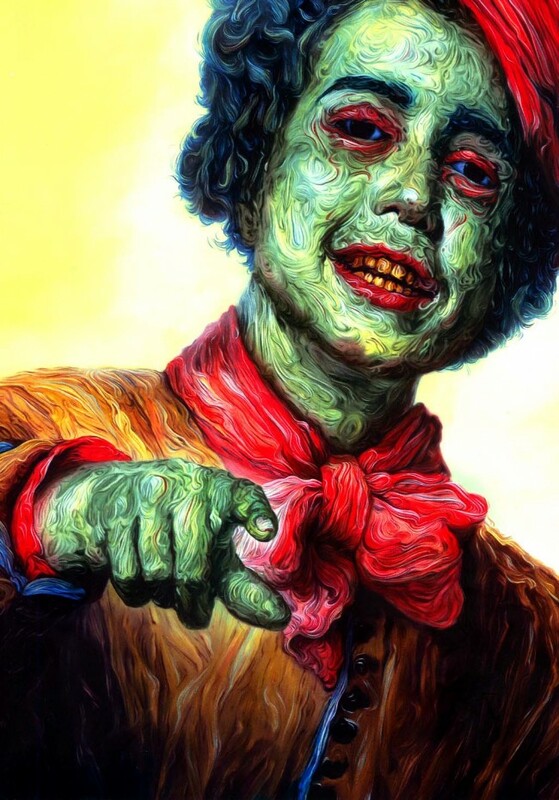 Notably, Turner prize winner Glenn Brown; renowned for his colourful yet morbid painting style (see above), as well as controversy over claims that his prize winning painting plagiarised the cover of a science fiction book. Then there was Dermot O’Brien, who is most well known for his explorations of material and light in his extraordinary wood and light sculptures (see top right), while Anya Gallacio now develops elusive art installations all with the disappearing theme of temporality - often leaving no physical or photographic remains of her art. 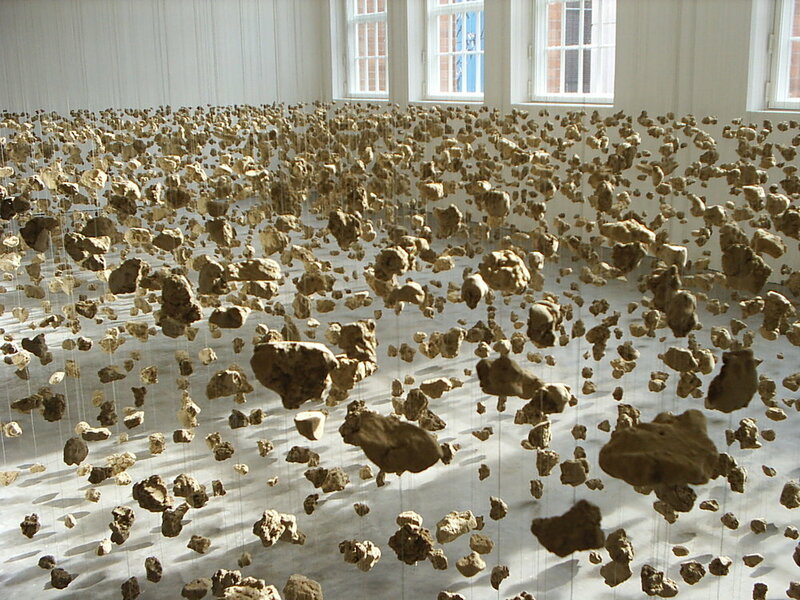 Cornelia Ann Parker OBE, a sculptor and installation artist, is famous for her body of work Subconscious of a Monument (see bottom right). It is composed of fragments of dry soil suspended on wires from the ceiling - interestingly, the earthy lumps are bits of clay removed from beneath the Leaning Tower of Pisa in order to prevent its collapse. 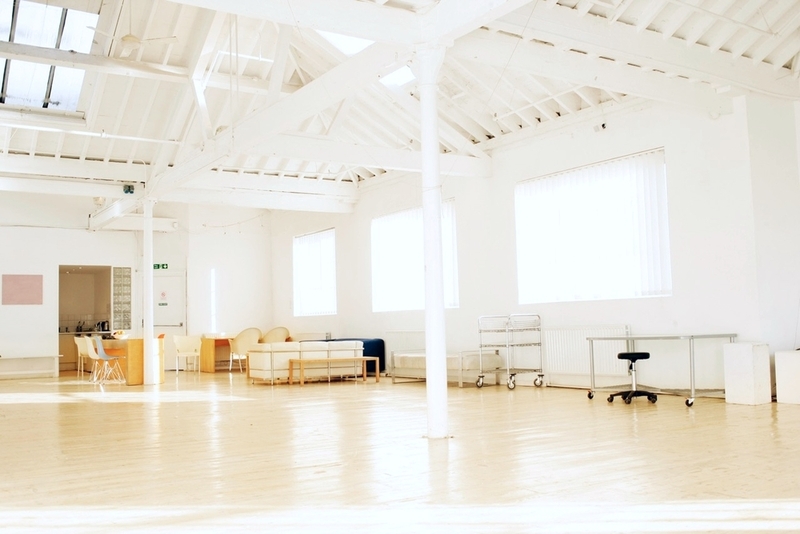 Curtain Road Arts was also home to The Agency Gallery, which opened in 1996 and has since moved to Canada Water. The Agency was renowned for realising early shows with artists such as Douglas Gordon, Zoe Leonard, Ken Lum, Thaddeus Strode and Peter Zimmermann and carefully placing works in private and museum collections. 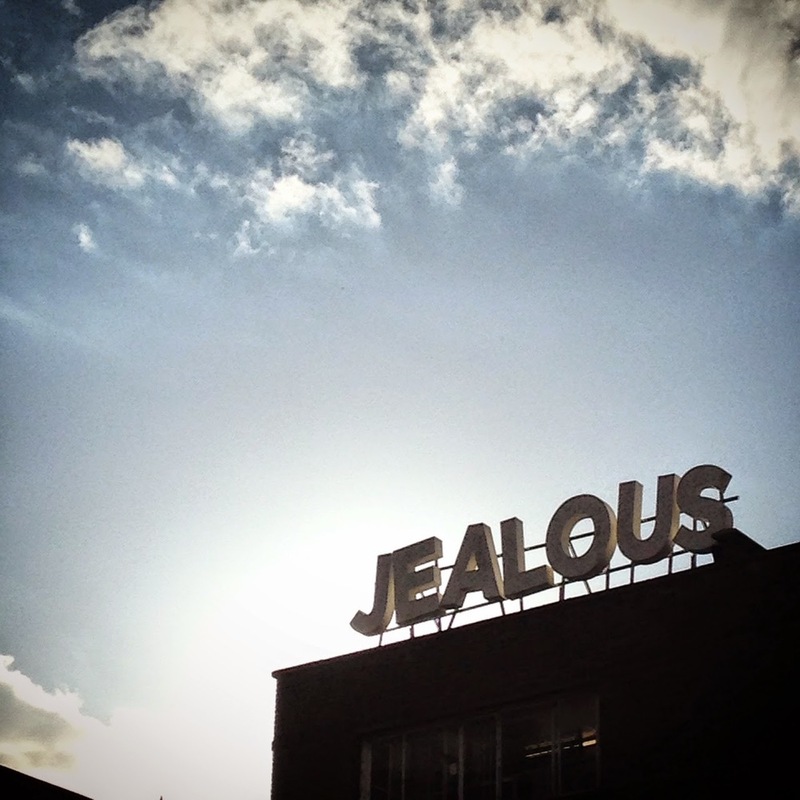 Sadly Curtain Road Arts closed in 1999 and a number of the artists founded a similar but smaller project called Mellow Birds, which ran until 2002. 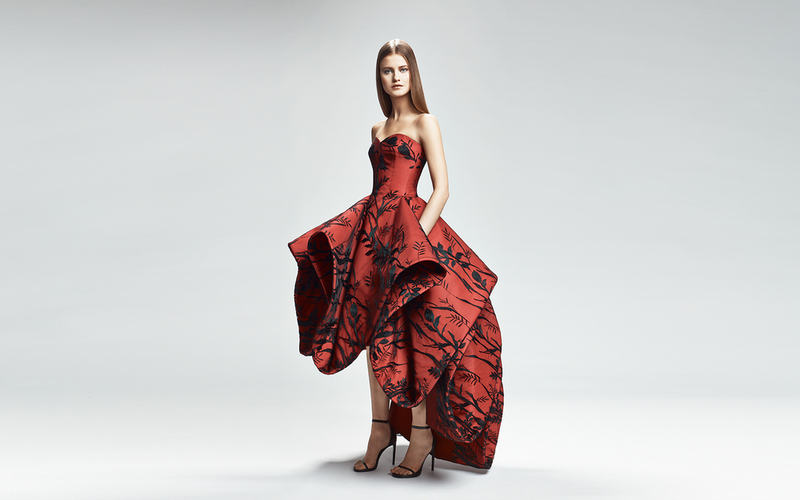 The only college in Britain to specialise in fashion education, research and consultancy is also famous for hatching design nobility such as William Tempest, shoe guru Jimmy Choo, and former Morocco prime minister Driss Jettou. The building itself was previously the Shoreditch Technical Institute Girl’s School, an early trade school for women to train in skilled labour for industries including dressmaking, millinery, embroidery, tailoring and hairdressing. Graduates of the schools found work either in the garment factories of the East End or in the skilled dressmaking and fashion shops of the West End. The term finished in March, just in time for students to (cat) walk into jobs preparing for the London season of balls, parties and social events. In the 1930s, and through the war, the fledgling ready-to-wear market was booming and the school trained its pupils accordingly - a forward-thinking approach as pioneering today as it was back then. 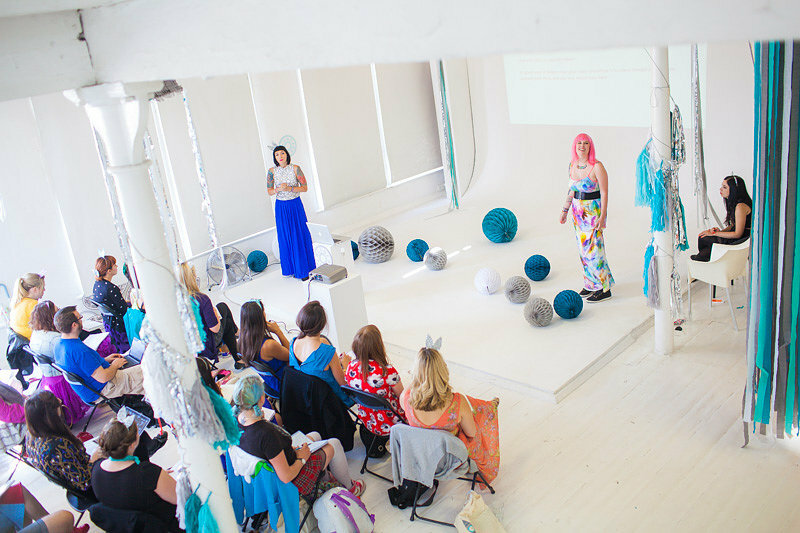 The institute was renamed London College of Fashion in 1974 and has been strutting its stuff as a leading global provider of fashion education ever since.